I don’t particularly care how people vote, but I do care whether they believe in freedom. That’s why I periodically share stories that should convince everyone to believe in the libertarian philosophy of small government, individual liberty, and personal responsibility. The stories that get me most agitated are the ones that involve innocent people being robbed by bureaucrats. And when I say robbed, I use that word deliberately. Such as the case of an elderly couple who had their hotel stolen by government. Such as the case of the family grocer who had his bank account stolen by government. Such as when the government wanted to steal someone’s truck because a different person was arrested for drunk driving. Such as when the government tried to steal the bond money a family collected to bail out a relative. Such as when the government seized nearly $400,000 of a business owner’s money because it was in the possession of an armored car company suspected of wrongdoing. Such as when the government sought to confiscate an office building from the owner because a tenant was legally selling medical marijuana. Such as when the government killed a man as part of an anti-gambling investigation undertaken in hopes of using asset forfeiture to steal other people’s cash. With all this background, you can probably guess I’m going to add to that list. And you’re right. We have a report from the New York Times that has me frothing at the mouth. I can’t imagine any decent person not being outraged by this example of big government run amok. For almost 40 years, Carole Hinders has dished out Mexican specialties at her modest cash-only restaurant. For just as long, she deposited the earnings at a small bank branch a block away — until last year, when two tax agents knocked on her door and informed her that they had seized her checking account, almost $33,000. The Internal Revenue Service agents did not accuse Ms. Hinders of money laundering or cheating on her taxes — in fact, she has not been charged with any crime. Instead, the money was seized solely because she had deposited less than $10,000 at a time, which they viewed as an attempt to avoid triggering a required government report. In other words, this is an example of two evil policies – asset forfeiture laws and money laundering laws – coming together in a vortex of we’ll-screw-you-over-even-if-you’re-law-abiding statism. And you can forget about the Constitution’s presumption of innocence. Ms. Hinders said in a recent interview. “Who takes your money before they prove that you’ve done anything wrong with it?” The federal government does. Using a law designed to catch drug traffickers, racketeers and terrorists by tracking their cash, the government has gone after run-of-the-mill business owners and wage earners without so much as an allegation that they have committed serious crimes. The government can take the money without ever filing a criminal complaint, and the owners are left to prove they are innocent. Many give up. Of course, much of tax code enforcement is based on the upside-down premise that taxpayers are guilty and have to prove themselves innocent. But that still doesn’t make it right. 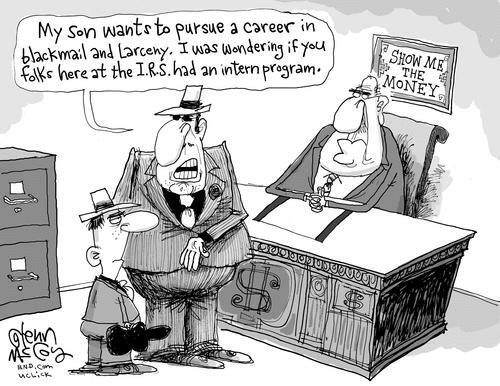 And the IRS is just the tip of the iceberg. Stealing is now a common practice by all sorts of bureaucracies at all levels of government. The practice has swept up dairy farmers in Maryland, an Army sergeant in Virginia saving for his children’s college education and Ms. Hinders, 67, who has borrowed money, strained her credit cards and taken out a second mortgage to keep her restaurant going. Their money was seized under an increasingly controversial area of law known as civil asset forfeiture, which allows law enforcement agents to take property they suspect of being tied to crime even if no criminal charges are filed. Law enforcement agencies get to keep a share of whatever is forfeited. Critics say this incentive has led to the creation of a law enforcement dragnet, with more than 100 multiagency task forces combing through bank reports, looking for accounts to seize. Here’s just one horrifying example of how this process works. Still not convinced about the venality of big government? Here’s another nauseating example. By the way, some of you may be thinking that these terrible examples are somehow justifiable because the government is stopping crime in other instances. But that’s not true. Experts who have looking at money laundering laws have found that there’s no impact on genuine criminal activity. But lots of costs imposed on innocent people. Which probably explains why the first two directors of the Justice Department’s Asset Forfeiture Office now say the laws should be repealed. If you want more information, here’s my video on the government’s costly and failed war on money laundering. By the way, the government also abuses people in ways that have nothing to do with money laundering or asset forfeiture. The federal government threatened to imprison a woman for whistling at a whale. A must-be-read-to-be-believed story of vicious IRS persecution. A video about how the EPA tried – and fortunately failed – to destroy a family. A story about the Justice Department’s discriminatory attack on a hapless homeowner. Bureaucrats in Indiana conducting a spite-motivated legal attack against a family that saved a baby deer. A local government in Virginia unfairly trying to destroy an organic farmer. Park Service bureaucrats threatening a business if it allowed tourists to use bathroom facilities. And there are more examples where those came from. As a libertarian and liberty minded individual, as long as I am not doing anything to harm anybody, then I should be left in peace, be able to do to myself anything, be it a stupid or being a sensible thing. If nobody else gets hurt in the process, government intervention is an inappropriate thing. People do stupid things, however, in many cases, the government should not do anything because people learn to self correct. Hmmm. So I suppose that soon you’ll condemn without qualification or weasel wording all factions of the Abrahamic mafia, and not just the Muhammadan faction, either. I think most bureaucrats are motivated by spite and not just in Indiana. Spite, envy and greed. Sorry, but for some reason that was the wrong link. I think it takes you to the most recent of a list of his videos. It is also good, but let me try again…. John Oliver recently took a comic/serious look at the Civil Forfeiture issue.